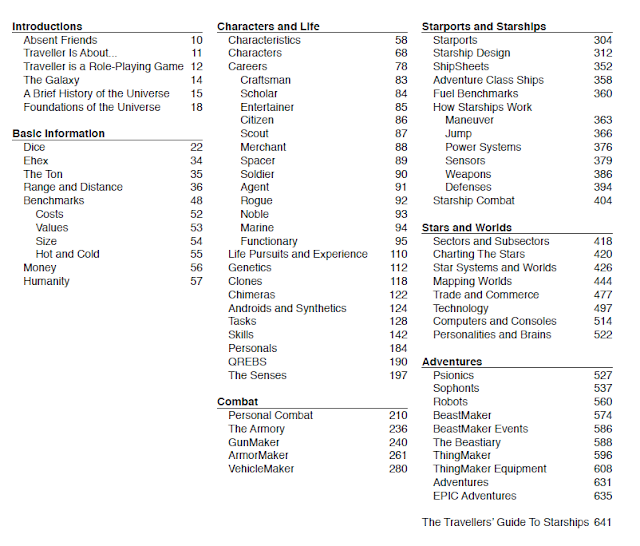 UbiquitousRat's Roleplaying Dreams: Traveller5: Anyone for Awesomesauce? Arriving home last night, having dashed through the traffic to be back in time to greet my inlaws who are visiting this weekend, I was excited to find that the Postman had delivered something... large. Upon opening the beautifully wrapped package I was confronted with the reality of something that I have waited a very long time to get my hands on: Traveller5 had arrived. In the box were the items shown to the right: T5 Core Rules (656 pages), Core Rules CD-ROM, Jump Drive (Core Rules on USB stick), Traveller Dice set (10x Black, 1 Yellow, 1 Red, 1 White), extra Traveller Dice, 2x Cr25 Imperial coins, Membership card for Traveller's Aid Society, Patent of Nobility as a Knight (in my name, customed to my own world). I don't remember the exact day that I received my Traveller5 Beta CD-ROM. But it was a very exciting day. Last night I told friends that I'd been playtesting this thing for something like 8 years... and, thinking about it, that wasn't far off. What amazes me most - and highlights the genius of Marc Miller - is that things haven't changed all that much... at least, in terms of the big things. It has just been a long period of tweaks and edits. The slow, long aggregation of small, incremental improvements. Today Marc refers to T5 as the "Ultimate Edition" of his long-loved SF RPG. 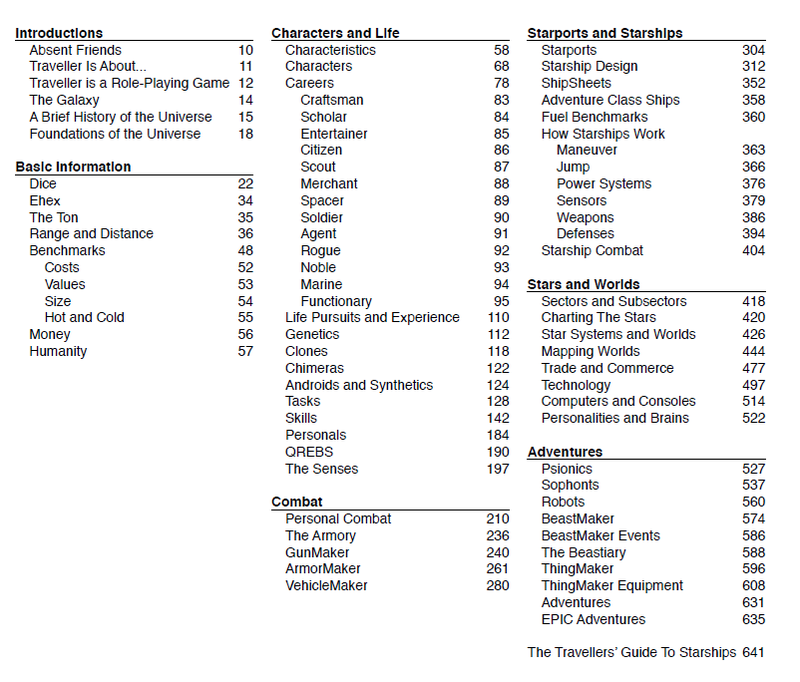 First of all, this is the most complete edition of Traveller ever written and put into one tome. It's massive. Actually, in truth, it's too big. Thankfully, following the massively successful Kickstarter campaign last year, Traveller5 is expecting the "Player's Edition" of the book: a shorter selection from the Core Rules designed to deliver just what the player needs, leaving the main book as a tool for the Referee. Nonetheless... this is an impressive tome. It's beautifully simple in layout and design. Black two-column text which evokes the feel of Classic Traveller. Yet this is no "Little Black Book". It's one of the thickest books of any kind on my shelf. Oddly, it's a book that I'll not need most of for the majority of the time. Design some characters for your group, learn the very easy to grasp Task rules and Combat rules... and you'll only use the rest if you are building something for your game. In some ways the sheer size of the book belies the simplicity of the system. I'd like to point out that this game is not just for the OTU. Certainly, T5 is optimised for the Traveller setting. Yet it's is written to be the "ultimate SF game", not just another edition of itself. Marc has designed the game completely ready to be used in Your Traveller Universe. I've been using this ruleset to prep my group to play in the Serene Dawn setting. We did characters some months back... and then got side-tracked into a fantasy campaign. 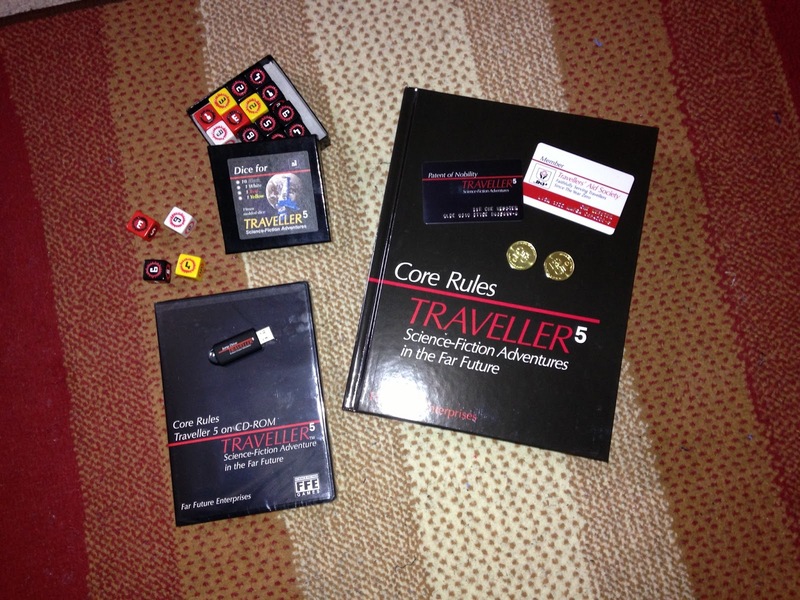 Last night, when the T5 book arrived, the question was asked by one of the guys: "When are we going to play Traveller, then?" Soon, I hope. It's just too cool to leave on the shelf. Yeah, I know. This is an exciting book to receive and yet, given my chaotic approach to gaming, it's also not necessarily going to get used as much as it should. Traveller5 is something of a dream come true. As a long-term fan of the game, having collected every book from every edition and having played since I was a pre-teen school boy, this is pant-wettingly cool. Geekdom come home, so to speak. But it is a flawed dream. It is a game that is ultimately Marc Miller's creation... and Marc doesn't, in my opinion, always get it right. I'll be hacking my own Psi system, for example. I'll also be adding a Magick system to suit my own game (unsurprising as this is not a fantasy game: ultimate SF system, remember). And I'll not be using most of the design rules very much because, for a lot of my gaming, eye-balling and winging it is my style. But the core of the game is sound. I love the d6-based game engine. I love the background building nature of character creation. You'll hack it and you'll mod it. But you'll play it... when it's finally on general release, at least. Just make sure you get past the first 50-odd pages and delve into playing it.